Goji berry, also known as wolfberry, is a very powerful antioxidant fruit from a Chinese plant, which can be eaten raw, cooked, or dried. Over the years, interest in goji berries have increased for their novelty and supposed nutrient value. They have been termed as a super-fruit. In traditional medicine, the whole fruit or its extracts are said to have numerous positive health effects. Diabetes, hypertension, fever, and age-related concerns can be treated with goji berries. The size of a raw goji berry is not bigger than the tip of your little finger. Though goji berries have been considered as natural remedies for diabetes, hypertension, fever etc., there is no scientific confirmation. This fruit has a little sweet taste. Goji berry is also good for healthy skin; it is an excellent source of antioxidants; and helps boost the immune system. A Chinese journal, way back in 1994, published about a study which stated that goji berries when added to the treatment of about 80 people suffering from cancer showed improvement. It is also believed that goji berries help defy age. Goji berries have the highest Vitamin C contents of any fruit in the world. 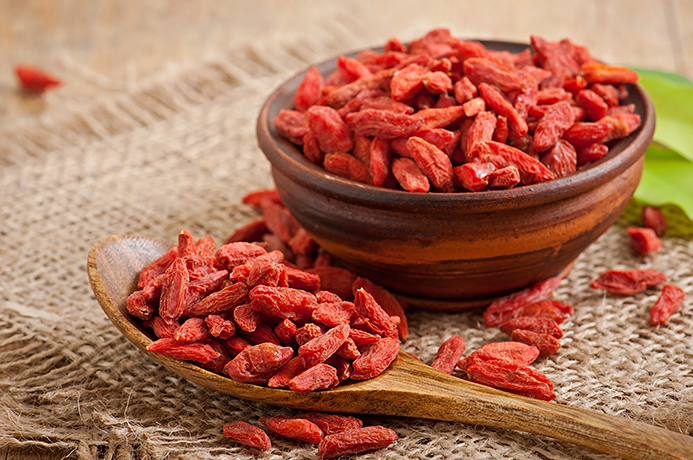 Goji berries are best ingested in their dried form. Dried goji berries are common add-ons to Chinese soups and salads, rice porridges, almond tofu (jelly dessert), etc. They can also be used as beverages in the form of tea or juice. Goji berry leaves are eaten as vegetables. Goji berries contain various essential vitamins and minerals. These include: vitamin A and C, fiber, iron, and Zinc. In a natural product like this, surprisingly good amount of protein is also found. The proportion of carbohydrates present in this fruit makes it rich in fiber. Hence, the glucose of your body will rise gradually, lessening the danger of a sugar crash later. A very common use of goji berries is in Traditional Chinese Medicines. For many years, goji berries have been utilized in the treatment of various common medical issues like fever, hypertension, diabetes etc. Among many antioxidants present in goji berries, one of them is zeaxanthin which promotes better vision. Goji berries also prevent eye disease, cataracts, glaucoma etc., and reduce visual fatigue. Zeaxanthin also helps avert the damage caused from UV rays, free radicals, and different forms of oxidative stress. Age-related disease such as macular degeneration, the significant reason of blindness in older adults, can also be taken care of. It is also said that adding goji berry juice into your daily regime or as a dietary supplement for about 3 months, may enhance the oxidant levels remarkably. This can result in protection from hyperpigmentation and assembling of oxidative stress elements which can damage the macula. The two nutrients required to build immunity and prevent usual afflictions or chronic diseases are – Vitamins A and C. Nature has bestowed goji berries with a high level of these antioxidants. They reinforce, stimulate, and balance the immune system. Substantial antioxidants present in goji berries have great effect on ageing cells, resulting in healthier, longer youth. Goji berry can fight cancer cells, tumor growth, and detoxify the body. It prevents cell degeneration and reduces reproduction of cancer cells. Fiber content, being higher in goji berries, helps maintain weight. Regular intake may reduce the amount of calories you would otherwise take, as goji berries make you feel fuller for a longer period of time. This reduces hunger, resulting in weight loss or balanced weight. Goji berries also help in good digestion and absorption of calcium. They play a major role in preventing deficiencies and withdrawal effects while dieting. Reducing the sweet tooth level is another forte of this fruit. Goji berries keep a check on diabetes by controlling the release of sugar levels into the blood. They also enhance glucose responsiveness, resulting in remarkable hypoglycemic effects and insulin-sensitizing activity. 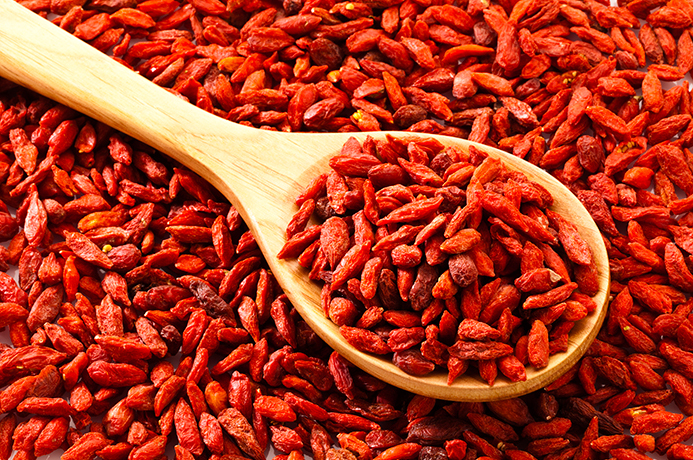 Goji berries can be the best option to control blood-sugar levels. They can act as natural sweetener. Goji berries prevent cardiovascular diseases and balance blood-pressure. Improvement in blood circulation is also seen with regular intake of this fruit. It also fights insomnia and reduces stress and anxiety levels which could lead to increased blood-pressure. It also has the ability to reduce the symptoms of depression and restore good health. According to the Chinese tradition, goji berries help the reproductive system and ameliorate fertility in both, men and women. Regular intake of this fruit can enhance the quality and quantity of sperms. In females, while treating premature ovarian failure and inability to ovulate normally, goji berries play a vital role and can be a part of the dietary supplements during the course. It is interesting to know that the Traditional Chinese Medicine practitioners used to prescribe the intake of goji berries as a part of daily dietary supplements to females with fertility issues. This was to restore hormonal imbalance. The Chinese also believe that goji berries help protect the testicular tissues against the damage caused to due to various reasons. Conclusion: Very effective to fight infertility. Regular intake of goji berry can increase energy levels, enhance moods, and improve the digestive system as well. It also fights chronic or temporary fatigue, restoring strength and energy. Goji berries protect the skin, and help healing cuts and injuries. Slowing the aging process, they can keep the skin healthy and body energized. Goji berries help keep the liver and kidney in good condition, resulting in vivacity, robustness, and well-being. Even if we consider the facts and researches being true, a doctor must be consulted before adding goji berries into your eating regimes. If you have already taken this fruit into course, do check your glucose levels at regular intervals. This could be an alert especially for people with blood-sugar imbalance. Blood-thinner medicines and goji berries may interfere each other. It might not be a good option for elderly people to add this fruit in their dietary supplement list. The reason being: Increased blood flow, due to goji berries, may lead to increased bleeding during injuries; moreover, a compound named atropine found in goji berries can cause dizziness, nausea, and blurred visions. In conclusion: According to the Traditional Chinese Medicines, goji berries have enormous health benefits. However, before adding this fruit into your daily regime, consult a doctor, as every ‘body’ is different.